The North States Superyard Colorplay Ultimate Playard is festively colored and adaptable. 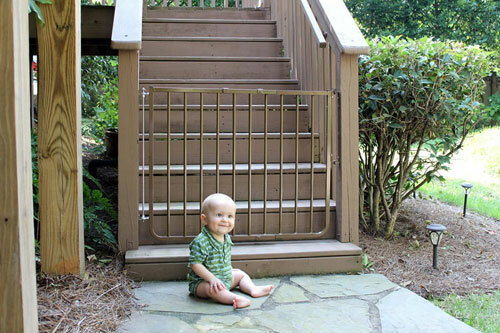 When little ones are at the point of getting into everything, a baby gate play yard can be an important asset for parents. The most important aspect of a play pen is that it helps keep your child safe, and that in turn gives you extra peace of mind. Watching your child gain the skills of mobility is no doubt a wonderful experience, but a child’s increased mobility makes a parent’s job even more difficult. Small explorers can often move with speed and sneakiness that’s hard to keep up with. Babies making messes and taking some tumbles is inevitable at this stage of life, but as caregiver you need to minimize risks for your baby. The ability to contain your child’s movement to a designated and controlled area can prevent accidents and messes that might otherwise put a damper on both parents’ and babies’ days. 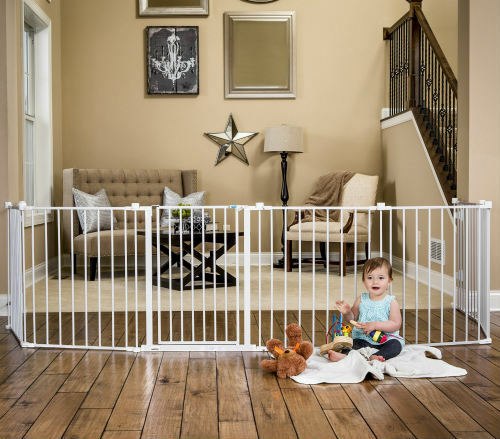 With these considerations in mind, we’ve put together this list of what we have found to be the best baby gate play yard options in 2016, and we hope it helps you find the right one for your home. Hopefully the comparison chart above is useful in getting a quick sense of the variety of baby gate play yard models available at various price ranges. Below we’ll highlight a few of our favorite models and go into more detail about what makes them popular choices. The Regalo Super Wide is in a class all of its own in terms of adaptability, and can be used as either a standard baby gate or a baby gate play yard. 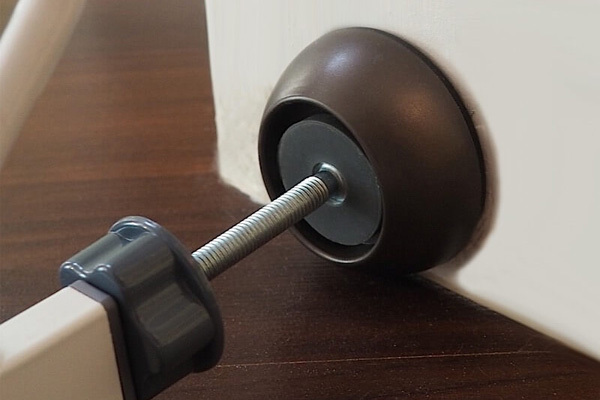 It accomplishes this versatility through the use of 8 folding, detachable, 24-inch wide steel panels. One of these panels has an easy-open door with a safety locking feature. 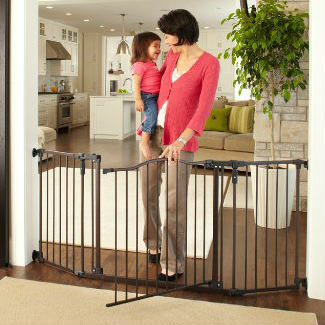 Each panel pivots so you can shape the gate as suits you, and you don’t have to use all the panels. 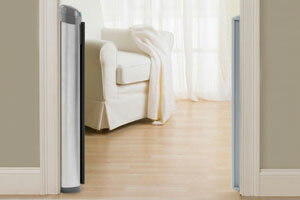 This lets you enclose a space as small or large as you like. 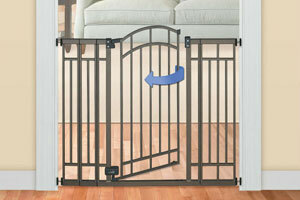 When all panels are used to form a play yard, this model provides 19 square feet of space for your child. 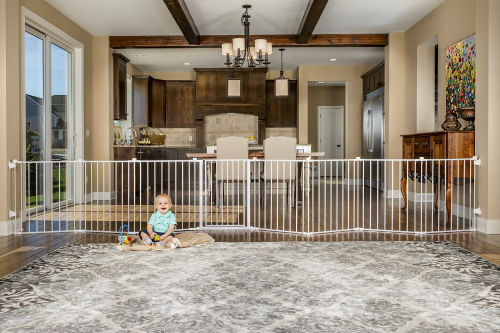 What’s more, if you want an even larger play pen or baby gate, all you need to do is buy another set as you can continue to connect more panels. 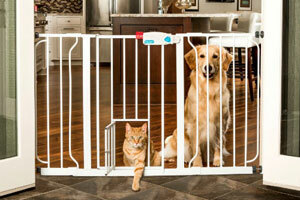 Adding more convenience, when you’re done with the gate it folds down into a small, portable package. The thoughtfully designed North States Superyard Colorplay Ultimate Playard forms an 18.5 square foot play area for your tots. 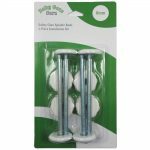 The weather resistant plastic material makes this model suitable for both indoor and outdoor use. 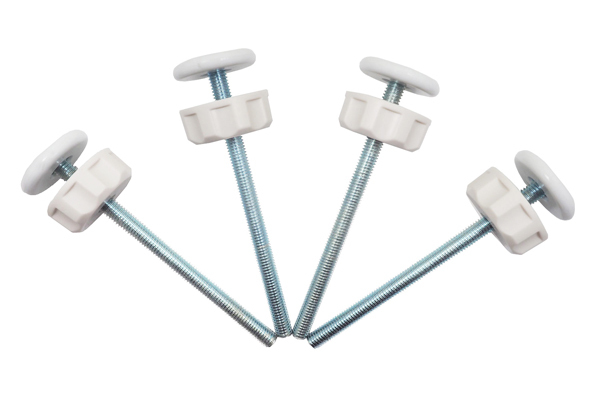 It is composed of 6 removable and adjustable panels. 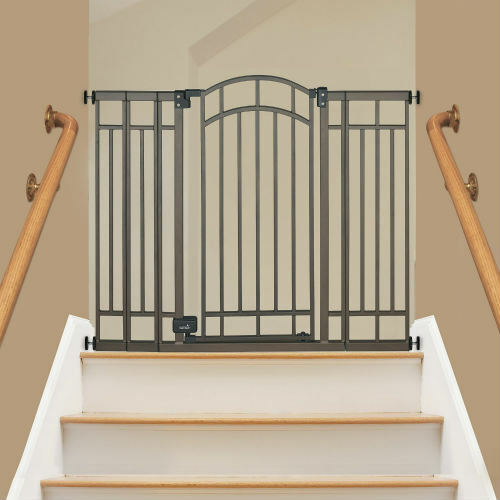 No hardware is required for assembling this baby gate play yard; rather this model is designed so that its panels simply click into place. 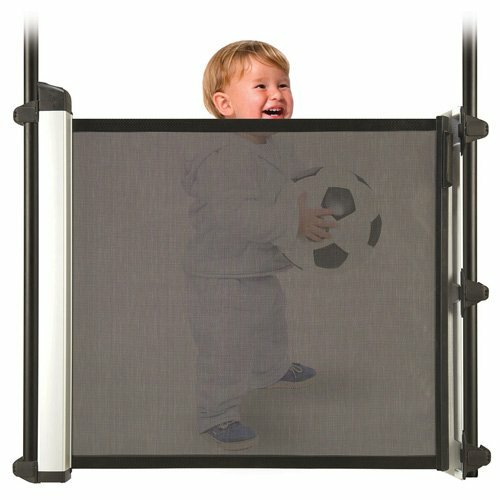 These features allow you the flexibility to easily adapt your child’s play space as needed. Further adding to this design’s flexibility, the combined weight of all six panels is just 20 pounds. 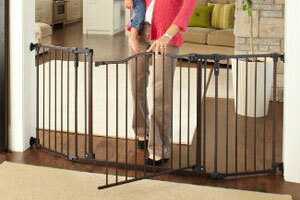 Note: North States also sells Extension Panels in packs of two, making it easy to create a larger play pen. The panels are 26″ high. This is a great height because it is easy for parents to step over, while at the same time being high enough so children aren’t able to climb out. 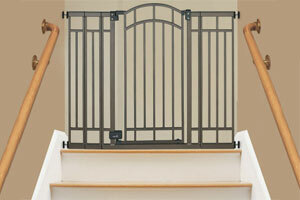 This gate also has an accessible door that can be opened with one hand from the outside. The North States Superyard Colorplay Ultimate Playard is made in the USA, and is phthalate, lead, and BPA free. All North States products come with a limited full-year warranty and are certified by the Juvenile Products Manufacturers Association (JPMA). On top of that, the colors are pretty cute for kiddos. It’s useful before you start shopping to consider what exactly you need in a baby play yard. Does it need to be easily portable? 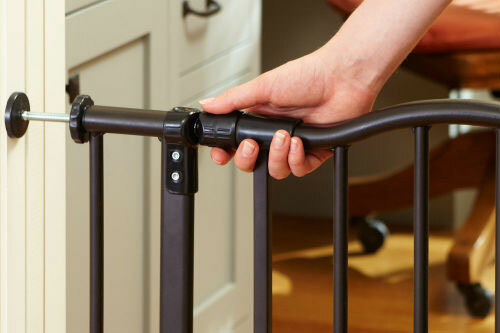 Would you prefer attachments like a bassinet or a changing table? Would you like it to be adaptable as your baby grows from an infant into a toddler? The Nightlight, an online publication focused on reviewing the best baby gear, has an excellent article on all about baby play yards for further reading and more options.